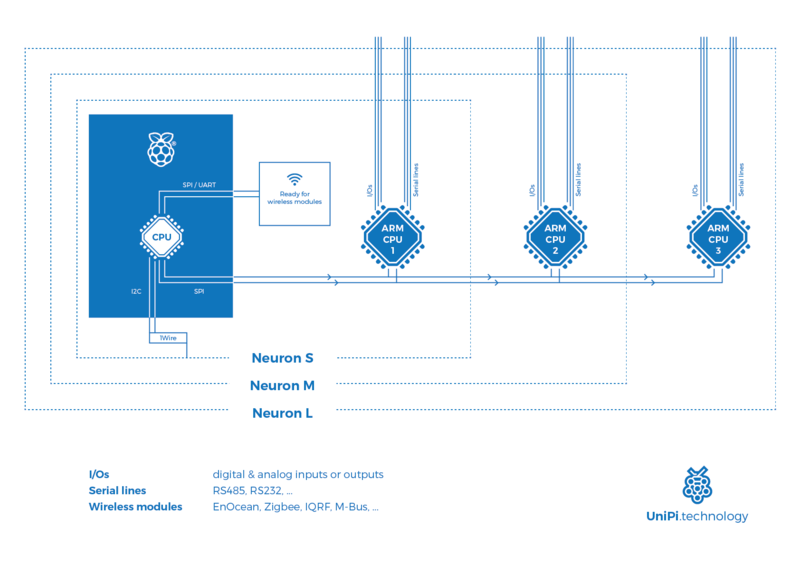 UniPi Neuron is a modular programmable logic controller (PLC) product line designed for control, regulation and monitoring of smart building systems, HVAC (Heating, Ventilation, Air Conditioning) systems and both home and industrial automation systems. Thanks to its modular architecture and compact design, the Neuron represents a highly flexible and affordable solution for quickly expanding field of smart technology. Customers can also utilize the Neuron for smart energy management to achieve better energy efficiency and reduce expenses. Each Neuron model is divided into one to three input-output (I/O) groups depending on model, each containing a group of input, output and/or communication modules. The Neuron can contain 1 (S-series), 2 (M-series) or 3 (L-series) I/O groups. Each I/O circuit board is controlled by its own STM32 processor, which controls inputs and outputs and communicates with the central processing unit (CPU). Processors are using custom firmware containing not only basic I/O functions, but also additional functions and features. All Neuron models are using the Raspberry Pi 3 Model B as its central processing unit. 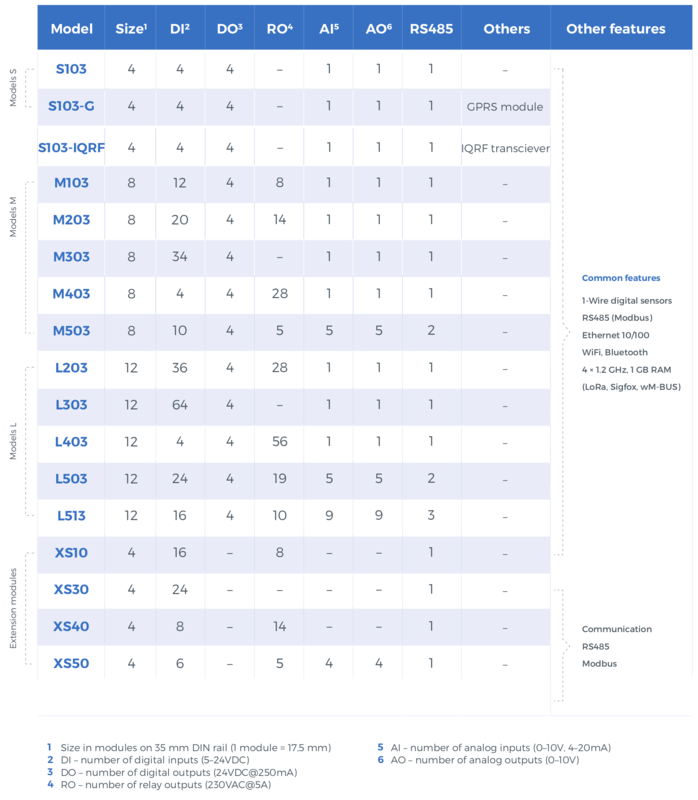 Each I/O group is connected to the CPU and to a central communication channel for all group processors. There is no communication between I/O groups. Each processor can also function independently on the CPU, allowing users to retain basic control of I/O modules in the event of CPU malfunction or software issue. Digital outputs (DO) are used for controlling two-state devices such as lights, door locks, window blinds etc. Digital outputs on our controllers also feature the PWM (Pulse-width modulation) function, enabling a special type of analogue control. Outputs are of the NPN type (open collector) and are able to control devices with voltage up to 50V and up to 750mA load current. Relay outputs are used for control or switching of devices with higher current loads. ROs are thus suitable for controlling light bulbs, thermoelectric valve drives, water heaters, pumps etc. Relay outputs on UniPi controllers are rated for 5A max. current at 230V AC/30V DC voltage. Analogue outputs (AO) features two modes - 0-10V DC voltage or 0-20mA direct current. AI serves for control of devices with analogue input, such as three-way valves, lighting dimmers etc. Along with basic I/O features this product offer additional unique features, either improving its performance or making it ready for cases of emergency. Direct switch allows you to set appropriate device reaction based on input signal without a need of master control unit (Raspberry Pi computer build inside Neuron controller). This function is great for real-time applications. It also comes in handy in case of malfunction of the master control unit. It is possible to store default settings inside the module memory and when the device reboots, it configures itself according to stored default settings. This function periodically controls communication with the master control unit (Raspberry Pi computer). If for a period predetermined by a user there is no communication with the master unit, it will load and set the stored default settings. Your applications will function even in emergency cases. By default, all Neuron models feature up to three RS485 serial lines for connecting of external devices or extension modules (i.e. Extensions). 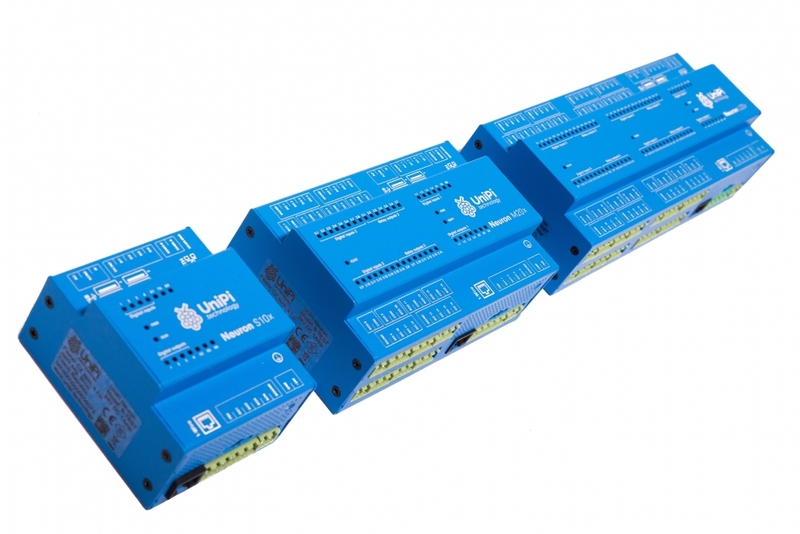 One line can communicate with up to 32 devices, using the Modbus RTU protocol. Each Neuron also features a single 1-Wire bus for the passive reading of data from corresponding 1-Wire sensors (humidity sensors, temperature sensors etc.). One bus can receive data from up to 15 sensors at once (provided a suitable 1-Wire hub is used).